How long until the Florida Antiquarian Book Fair? One of the most anticipated booksellers at the Florida Antiquarian Book Fair every year is Larry Rakow, owner of Wonderland Books in Cleveland Heights, Ohio. Larry specializes in old, out-of-print, and rare children's books, and is always a favorite among fair goers. Larry, a former children's and young adult librarian, opened Wonderland Books in 1990. He is a member of the Magic Lantern Society of the U.S. and Canada, the Movable Book Society, and a past president of the Northern Ohio Bibliophilic Society. His Wonderland Books features more than 12,000 titles, includign his favorite pop-up and novelty books, Caldecott and Newbery award-winning titles, Golden Books, and illustrated volumes from modern times all the way back to the Victorian era. "We pride ourselves on offering collectible books in extraordinary condition," says Larry. He delights in helping collectors complete their collections of Caldecott winners, Little Golden Books, rare Meggendorfer, Nister, and Raphael Tuck titles, as well as books from their childhoods. You can send Larry an email and inquire about books he'll bring to the Florida Antiquarian Book Fair. You can order tickets to the Florida Antiquarian Book Fair at Eventbrite.com. Among book fairs, some people think the Florida Antiquarian Book Fair attracts a particularly younger crowd. We happen to agree, and indeed, we celebrate it. And why not? St. Petersburg is a young, vibrant town. So is the whole Tampa Bay area. Young people are increasingly drawn to traditional books, and away from the devices that seem to permeate our lives. So it's no wonder that booksellers like Jerry Merkel of Xenia, Ohio, made the remark about the Florida show on a recent live streamed broadcast of Rare Book Cafe, the internet's only regularly scheduled program devoted entirely to rare and collectible books. Florida Antiquarian Book Fair, the southeast's largest antiquarian book fair, runs Friday, Saturday, and Sunday, April 26, 27, and 28 at The Coliseum in downtown St. Petersburg. Tickets are now on sale at Eventbrite.com. Valentine's Day is almost here so there isn't much time left to take advantage of this lovely ticket offer for the Florida Antiquarian Book Fair. It's the perfect gift for the book lover in your life. What does a book lover want to do? Spend the weekend at the biggest antiquarian book fair in the southeast. This is the gift that will continue to give long after its given. Why? Because Valentine's Day is a few days away but the book fair isn't until April. So there's the thrill of receiving tickets to the book fair on the special day for lovers. And then there's the even more special thrill of spending the weekend at the Florida Antiquarian Book Fair. Two thrills in one. What fun! So what do you have to do to get the savings on two weekend admissions to the book fair? Just click this direct link. You'll be taken to the book fair page on Eventbrite.com. 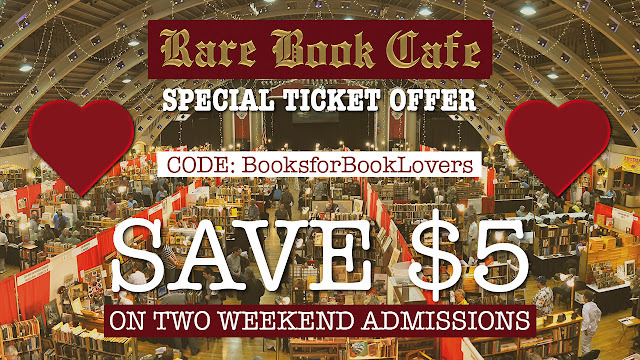 Click on TICKETS and proceed to buy two weekend passes to the book fair and save money in the process. Don't let this special offer get away from you. After Valentine's Day, it goes away. Act now and be a the perfect lover for your book lover. I had a delightful time on Saturday hanging out with Tiffany Razzano, the driving force behind Wordier Than Thou, the literary arts organization. We were on the deck outside the Flamingo Sports Bar, Jack Kerouac's favorite St. Petersburg dive bar back in the Sixties. Wordier Than Thou is presenting a Literary Roast of Jack Kerouac Fundraiser from 6 p.m. to 9 p.m. on Sunday, January 20 at The Studio@620 in downtown St Petersburg. We did a LIVE broadcast from there and over a couple of beers talked of various things literary in St. Petersburg. The original was broadcast on Facebook but there's recording of it embedded above. Tiffany told me she had developed the idea for a literary roast with plans to roast living local authors. Funny thing, there were no takers. Local writers didn't want to be targets of gentle, good-natured mockery. Hmmm. So she turned her attention to authors who couldn't take umbrage, and Kerouac, with his local connection (he lived here about five years) seemed to be the perfect choice. Perhaps. Some say Kerouac's spirit haunts Haslam's Book Store. If so, might he make his way to The Studio@620? Who knows? You can bet he'd have had plenty to say if he were alive. Join us on this blog for regular updates about the Florida Antiquarian Book Fair, the oldest and largest fair of its kind in the southeastern United States. You can subscribe to our blog below and get alerts on new posts. This is your source for the very latest information available about the book fair. The 2019 fair will feature dealers in rare books, antique maps, prints, ephemera and more. In the off season, you'll find book news here and recordings from Rare Book Cafe, our book lovers' rendezvous that is live streamed every Saturday on Facebook. Archives of our weekly show. You can watch LIVE Saturdays at 2:30 p.m. ET on Facebook. 5 p.m. until 9 p.m. Admission $10 (Tickets good all weekend). 10 a.m. until 5 p.m. Daily admission $6, Weekend admission $10. 11 a.m. until 4 p.m. Daily admission $6. Free Parking. Free entrance for children 12 & under and for students with valid ID. Copyright © 2019 Florida Antiquarian Booksellers Association. Simple theme. Powered by Blogger.